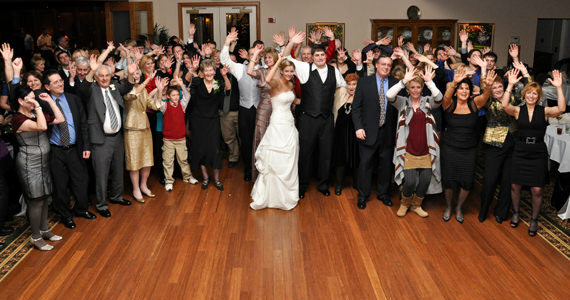 On Saturday December 19th 2009 we were at the Treesdale Golf & Country Club in Gibsonia Pennsylvania. 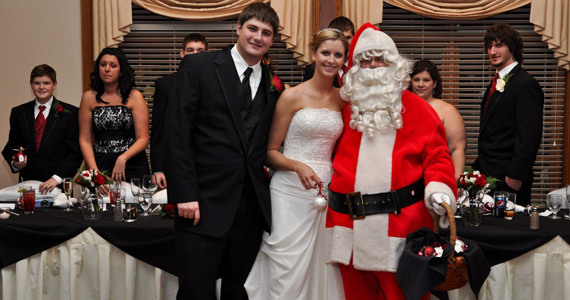 The event was a wedding reception for David and Kelsey Monteleone. 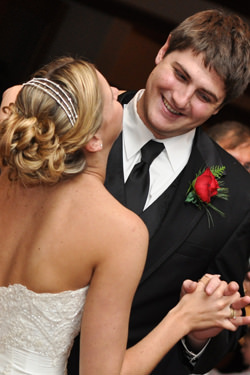 Kelsey and David were married at 3:00 pm at St. Killian Parish in Cranberry Township. Guests began arriving at Treesdale County Club shortly after 4:00 pm where they enjoyed appetizers and cocktails. The bridal party arrived at 5:00 pm after posing for pictures with wedding photographer Geoff Crowe of Alicia Photography. 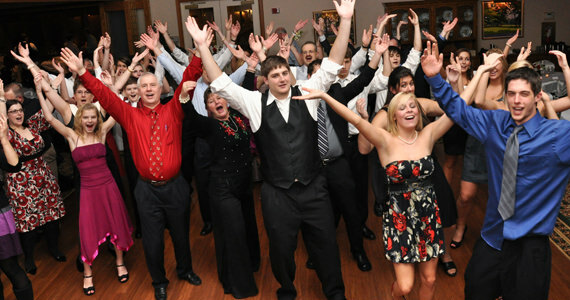 At 5:30 pm we formally introduced the bridal party to “Walking On Sunshine” by Katrina & The Waves. We then introduced Kelsey and Dave to “Sweet Caroline” by Neil Diamond. Next, Kelsey & Dave cut their wedding cake to “How Sweet It Is” by James Taylor which was followed by toasts by the father of the bride Richard Spencer, best man Michael Monteleone and maid of honor Brittany Spencer. Dinner was prepared by the culinary staff at Treesdale Country Club and was served sit-down style. After dinner, we introduced a surprise guest whose appearance was arranged for by the parents of the bride. IT WAS SANTA CLAUSE! Santa came bearing gifts, as he handed out a Christmas ornament to each of the guests. After Santa departed, we invited Kelsey and David to share in their first dance together as husband and wife to “Only You Can Love Me This Way” by Keith Urban. Kelsey & Dave then danced with the bridal party to “Bless The Broken Road” by Rascal Flatts. Next Kelsey requested a dance with her father Mr. Richard Spencer to “I Loved Her First” by Heartland and Dave danced with his mother Mrs. Joanna Monteleone to “Through The Years by Kenny Rogers. Through out the remainder of the evening, guests danced to music by The Village People, Jay-Z, Usher, Bon Jovi, Taylor Swift and more. At 10:00 pm we invited all of the guests to share in the last dance of the evening to “I’ve Had The Time Of My Life” by Bill Medley & Jennifer Warnes.